In just five days Culthe Fest 2019 will begin in Münster, Germany, and for the second year No Clean Singing is delighted to partner with Unaussprechliche Culthe in helping to spread the word. This is a two-day event, with performances on April 20 and April 21, and it features a remarkable line-up of bands from the realms of black metal, death metal, post-metal, and dark folk, plus an art exhibition (with works by Jeff Grimal, Irrwisch, and Carmen Alba), a panel discussion with Ernie of Krachmucker TV, and nightly after-shows. 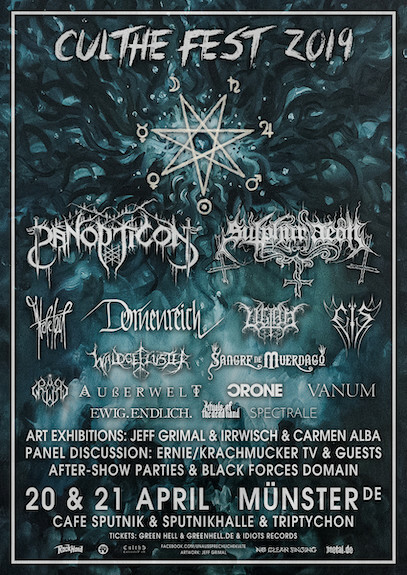 The headlining bands are tremendous: Panopticon (performing in Germany for the first time), Sulphur Aeon, and Dornenreich (performing mostly songs from Hexenwind and Her von welken Nächten). But the rest of the line-up is also enormously appealing. On April 20, doors will open at 12:30 p.m., and the performances will run from 13:00–24:00. On April 21, doors will open at 15:30h, and performances will run from 16:00–23:00h. The after-parties on both nights (which are free for festival-goers) will begin upon the conclusion of the stage shows. For those who may not be familiar with every band on the line-up, we’ve included further info below about each of them, as provided by the festival organizers. For the first time in Germany, one of a very few selected shows + only show in NRW and North West Germany. 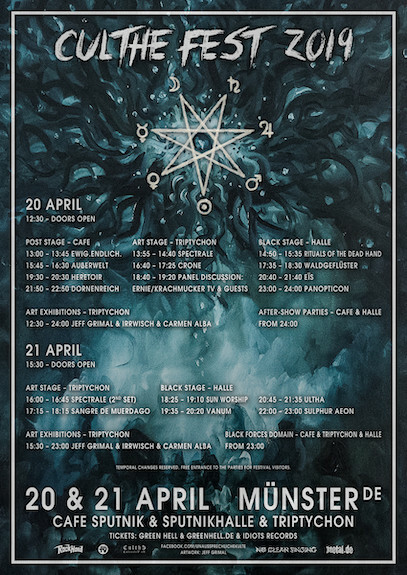 One of a few selected shows in 2019, for the first time in Münster + with new songs from their brand-new 3rd full-length The Scythe of Cosmic Chaos. Special performances of mostly songs from Hexenwind and Her von welken Nächten, feat. Heretoir‘s Eklatanz. Exclusive NRW tour show, for the first time in Münster. First show in NRW in 2019, for the first time in Münster. With members of King Apathy. With new songs from their 3rd full-length The Inextricable Wandering. With (ex-)members of Goldust, Planks, Sun Worship, Unru, and others. Special Geïst-era show, first show in NRW in 2019. Record release show of their upcoming 5th full-length, first show in NRW in 2019 + for the first time in Münster. First announced show in 2019, for the first time in Munster! With Antlers‘ Pablo C. Ursusson. One of a very few selected shows, for the first time in Münster + with new songs from their upcoming 2nd full-length Ageless Fire (released on 15 February 2019)! With ex-members of Ash Borer, Yellow Eyes, and others. First show in NRW in 2019, for the first time in Münster. Continuing since 2018 as a duo, with Lars Ennsen, also playing in Ultha and Unru. Playing new songs live on stage for the first time. First show in NRW in 2019, for the first time in Münster + rare opportunity to catch them live. With Secrets of the Moon’s Phil “sG” Jonas. For the first time in Germany. Solo project of Jeff Grimal (ex-TGOO), with further (ex-)members of TGOO. Two sets on 20 & 21 April. For the first time in Germany and official German presentation of their debut Blood Oath. With members of Hemelbestormer.